In honor of the opening of the new Crown Point Bridge across Lake Champlain (scheduled for Monday, November 7, 2011) I took my last free ferry ride and flew the Canon Powershot S95 over the Crown Point State Historic Site for three hours last week. The south wind was strong and steady at about 15 mph, but the Levitation Delta kite wandered a bit much to get good coverage for easy panorama stitching. I learned some new finesses of Microsoft ICE and was able to make some decent scenes with as many as 28 stitched photos, but could not construct a half-spherical panorama. 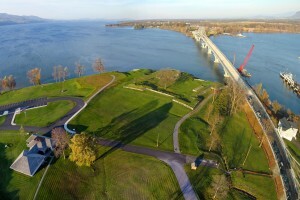 Fort St. Frédéric and the new Crown Point Bridge. See below for a link to the big view of this panorama. The narrow lake at this place has made it a strategic location for millennia. 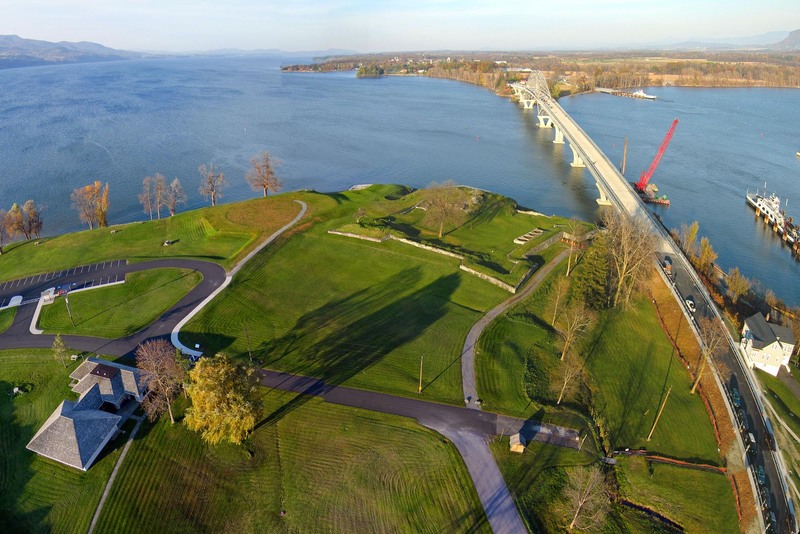 The British built a small fort in 1690, and the French built an elaborate one in 1738 to control north-south traffic on the water route between Montreal and Albany, NY. The British chased away the French in 1759 and started a new fort, one of the largest they ever built in America. It was damaged by fire and an explosion of the powder magazine in 1773, but the earthen foundations and some stone barracks remain. It is still easy to imagine soldiers on the banquette firing over the parapet onto the glacis where attackers would be fully exposed until they were stopped by the revetment (I read the interpretive signs). The classic five-pointed-star plan of the parapet can be best appreciated from above, so I was planning this flight all summer, and even spent two hours failing to get the camera airborne on an inconveniently calm day in September. The kite flew easily this time and carried the full KAP rig with a CAMremote controller. The CAMremote is smaller than a match book and can be programmed to turn the pan and tilt servos and fire the camera in any pattern. It had started its repeating six-minute sequence of photos at 10 pan and 5 tilt positions when I let the kite take it away. With 1000 feet of line out and the rig directly over the parade ground I could see through the binoculars that it was slowly doing its work, or so I thought. After 20 minutes I reeled it back down to check on things and found that the USB cable to the camera had pulled out just as I launched the rig. The 15 photos on the SD card were all of close-ups of grass. I sent it back up more gently this time and repeated the 20 minutes of hovering over the center of the star, this time with less line deployed. The panorama above is stitched from 28 photos (5 columns by 6 rows with two repeats to fool ICE). It took me three days to make the stitching work, which probably means it is time to move beyond free stitching software. Click here to see it at Photosynth, or you can click the leafy thing in the corner after it loads. The full panorama of the new bridge and the old French fort in the little image above can be viewed at Photosynth here. Then I started to walk around with the rig in the air. With the S95 pointing and shooting, I circumnavigated the entire fort, stopping at a dozen places to let the rig capture the fort from a new angle. My intent was to get coverage for a 3D model of the scene. After a few hours of matching control points this afternoon, I resubmitted the model to the Photofly servers and have not heard back from them for four hours. I guess I should have saved first. I am also uploading 57 photos to the Hypr3D servers where they might be analyzed to create a 3D terrain model. I will have to update the 3D progress later. I think this was one of my most efficient KAP sessions yet, notwithstanding the first half hour. The kite didn’t touch the ground for three hours, even as I pulled in the rig for inspections and for a fresh camera battery and SD card (all the delta needed to keep flying was the 150 feet of line above the rig). The S95 recorded 1700 ten MP jpegs on two 4 GB SD cards. The CAMremote performed well on its second outing, providing good overlap except when wind gusts interfered, and failing to trigger the shutter only a few times — so instead of five tilt positions, a few times there were only three. This might have been the camera’s fault, but either way it seems to be out of my control, which makes me grateful to have the results above. I have to consult a person the following. Which isn’t a thing Which i carry out! I like looking at a post that can make people consider. Furthermore, thank you for making it possible for me personally to be able to remark!